A neighbourhood worthy of some serious exploration is Naif. I might have made a similar proclamation two years ago, and I still stand by those words. If Naif was not such a constantly choked drainpipe of an area and so outrageously male-dominated, I know I’d be lunching there more often. When a friend drove me in last week for a West African food run, the parking situation was so abysmal that we resigned and painfully inched our way out of the tangled road mess. As I stared out of our air-conditioned car, turban-clad labourers were dragging heavy, heavy carts through the clogged alleys, their faces shriveling up with a midday sweat and their slow laboured steps making me feel weak and dehydrated. At that moment, I lost my rights to complain about summer. 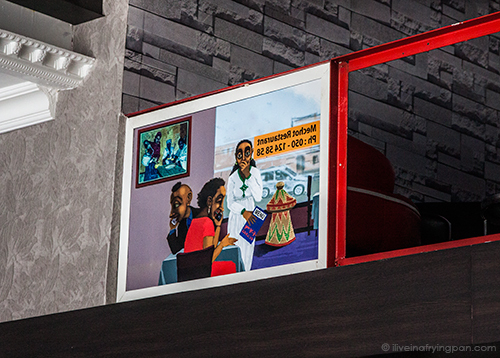 We finally pulled away from the suffocated heart of Naif and parked by a restaurant whose sign was painted in the reassuring colours of the Ethiopian flag. 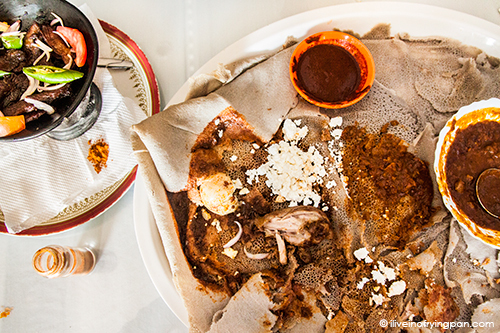 Naif and its surrounding areas have an incredible concentration of authentic Ethiopian food, so if you haven’t ventured out to try at least one of them during your time in Dubai, then I’ve got only two words for you: WAKE UP. 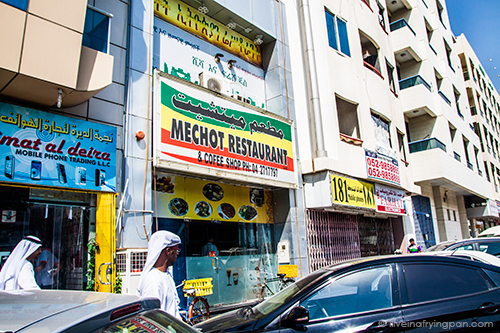 Mechot’s modest façade dissolved into a surprisingly spacious two-tiered restaurant with a few sheesha patrons sprawled out upstairs. We walked in at the time of the traditional coffee ceremony, where an Ethiopian server was roasting coffee beans beside a smoky incense burner and a traditional Ethiopian coffee table. A sweet-faced server approached us to clear any confused notions we might have had when we walked in: ‘This is an Ethiopian restaurant.’ Evidently, not many non-Ethiopians had wandered in for lunch before. A pity, because Mechot served us one of the most memorable Ethiopian meals I’ve ever had…to the point where I now irrationally inhale deeper whenever I remember Mechot, as though sour-pungent edge of the berbere spice used generously throughout our meal is still wafting about in the air. 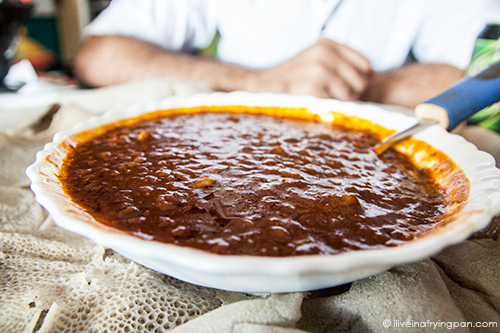 The highlight of our lunch was the Misir Wot with Meat, a sinus-clearing broth of lentils, onions and minced meat that made me race through reams of floppy fermented injera bread and wads of sniffly tissues. 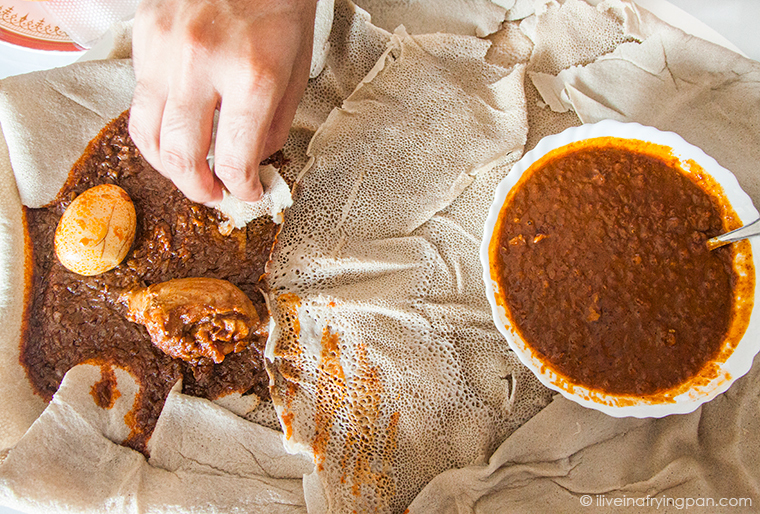 The aroma of the fermented injera bread mingled with the Misir Wot to give my senses a nostalgic patchwork of familiar memories: tangy pickled mangoes, mum’s meat and lentil ‘dalcha,’ melted homemade ghee drizzled over the rustic daal and rice fed to my toddler cousins in India back in the 90s. You can opt for the veggie version of the Misir Wot, but the meat really does do wonders for the dish, even though you might happen upon a chewy nub of lamb every now and again. As a break between my frantic messy bites of Misir Wot, I'd occasionally steal a charred beef strip out of the bowl of Kara Mara Tibs. My friend had ordered these extra dry, only to be eventually wetted in an irresistible berbere dipping sauce. The berbere mix used by Ethiopian restaurants contains a red chilli pepper that I’ve been desperately trying to better understand. It looks as dangerous as an Indian red chilli powder, but the only similarity is the colour. Once roasted, it tastes sour and pungent, yet doesn’t inflict the horrible chest burn that an Indian or Indonesian pepper is notorious for causing. In my quest for culinary knowledge, I’ve purchased half a kilo of Mechot’s berbere spice and squished it in the pantry between other eclectic and whimsically purchased ingredients, Persian khakisheer and a tub of Jordanian maqlouba spice to name a few. The chicken stew with a plump tender leg and a boiled egg (Doro Wat) was somewhat side-lined, less because I am partial to the version at Habasha and more because I was completely enamoured by the Misir Wot. Maybe I’ll return to taste the Doro Wat solo, maybe paired with a mellow clump of cottage cheese (aib)…maybe after another seven visits to get over my misir wot infatuation. 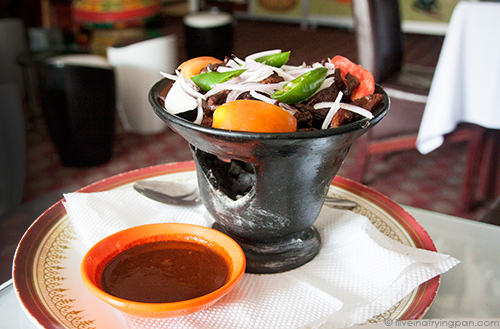 On a separate note, I’ve yet to come across an inhospitable Ethiopian restaurant. There’s almost always a lady-owner at the helm and friendly servers who are willing to explain every dish to the quizzical foreign customer. I have never met a grouchy Ethopian server, ever. So in case the thought of reading a menu full of alien Ethiopian dishes and mistakenly forking through raw bloody meat is keeping you at bay, stop being a worrywart. Go out there, experiment, eat up. For location details, check out my Google map of restaurant hideouts. 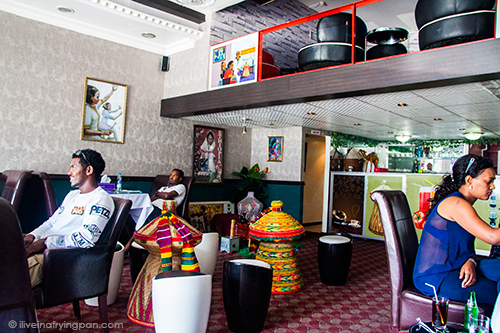 ← Older: In Photos: Dubai’s Alternative Iftar Buffet. I too fell in love with wat when we went to Ethiopia in 2006. I even brought heaps of berbere back with me and made it here – no injera though! Ah, GORGEOUS. Thank you for posting this. I will go with adventurous friends. I’m waking up! As soon as I’m back on these shores I’m making a bee-line for Naif. We went to Mechot tonight, 7 of us. We all LOVED the food. Definitely as authentic as in Ethiopia. We gorged and left with happy full bellies. 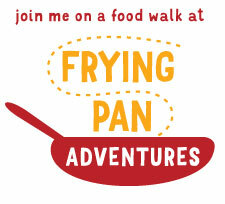 Thank you for lighting the spark for this culinary adventure. Lara, I’m thrilled to hear you visited Mechot and found the food authentic – now it has the seal of approval from someone’s who’s actually been to Ethiopia. Any recommended dishes beyond the ones I’ve suggested in the post?